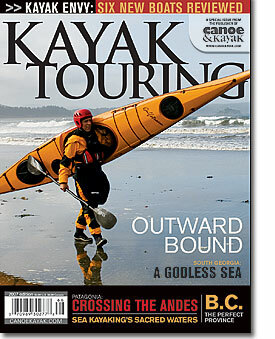 Who’d have thought of paddling across Chilean Patagonia? Not Magellan. We gathered around when Spelius spread his well-worn map of our route on the beach. Long and convoluted Lago Yelcho waited just a few miles downriver, then wound on for more than 30 kilometers through the glacier-capped mountains. Brian, a fresh-faced 20-year-old river guide, told us about a ferry boat caught in a sudden storm of Lago Yelcho some years ago. Heavily loaded with huasos (Patagonian cowboys) and their horses, the boat capsized, and even though the accident occurred close to shore, not a man or beast survived. We were beginning to understand why here in southern Chile , the wind is known as la escoba de Dios , God's broom. By late afternoon we were ready to launch. Spelius and his Chilean wife, Rosie, took the lead in their German double kayak. One by one we pushed off into the fast-flowing river. We were soon racing along faster than I had ever traveled in a sea kayak before. The tangle of thick temperate rain forest along the river's banks appeared to flash by. We scanned the river ahead for sandbars and other obstructions while at the same time trying to take in the breathtaking vistas that opened up around every turn. Suddenly, I noticed a disturbing change on the lake's surface in the distance. “Kinsey, look!” I said, pointing with my paddle toward a distinct dark line on the water. A powerful wind shear was quickly bearing down on us. “Get ready,” I shouted. I snatched my water bottle and wool cap from beneath the deck bungee cords and stuffed them into the cockpit. I snapped my sprayskirt back in place just in time. The wind slammed into us, and with amazing suddenness the placid lake transformed into rolling whitecaps. Two-foot-high waves broke over the bow and stuck me full in the chest. “Rudder right,” I yelled back to Kinsey. We headed closer to shore, hoping for more protection from the squall. The next morning the wind had vanished, and the lake was transformed back to the tranquil state of the previous morning. The Andes were reflected in the lake's near-perfect mirror surface. We slipped into our kayaks and continued paddling west through the mountains, toward the distant sea.